How to drop 40lbs from your 2003 350z, new seats! 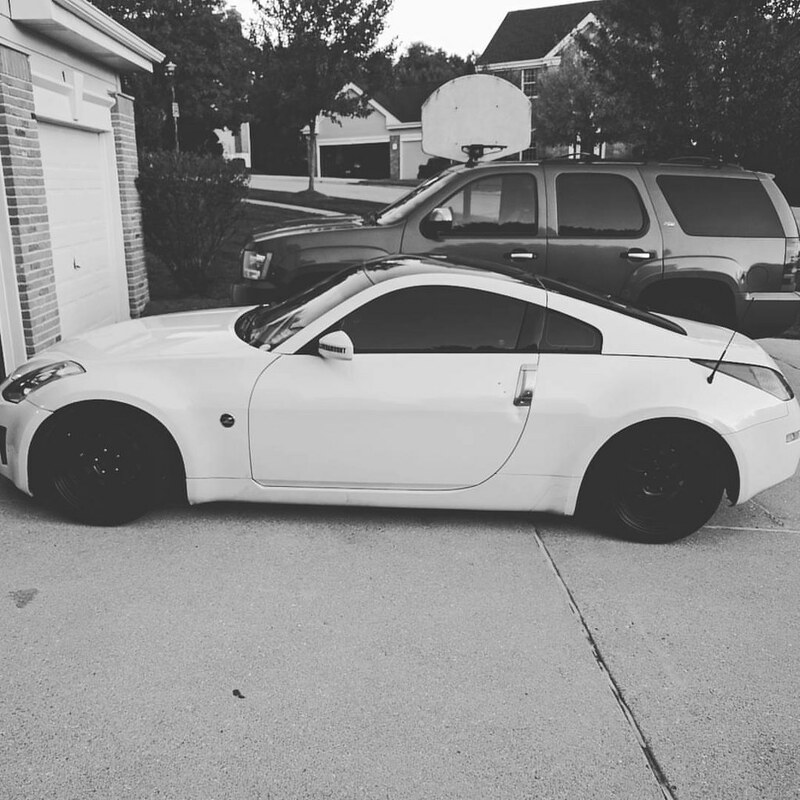 This weekend I spent some quality time finally working on the 350z before the upcoming autocross season (Dixie Champ Tour is coming up quickly). In prep for STU I want to see what kind of weight I can get out of the car, I really don’t know if this car (2003 Touring) can come anywhere close to what my first one (2003 Enthusiast, 3075lbs) weighed, or even the second one (2004 enthusiast, 3062). I have yet to get it up on the scales, but I assume going into this that the car is heaver than both of them. The power, heated, leather seats that came with the car, along with the potential extra stereo equipment, and electronics for the VDC mean the car likely weighs a good bit heaver than the previous cars. Earlier today I took the leaking wheel/tire to Solo Performance Specialties to take the tire off the rim and take a look at the wheel and see what the damage really was. After popping the tire off the wheel we quickly found that the wheel had a repair attempted both inside and outside of the wheel, it actually looked like someone had taken JB Weld to it. When I picked up the 350z in Chattanooga back in November, I figured out that the radio wasn’t great, the sound was weak, and it didn’t appear to pick up any FM signals whatsoever. Over the Xmas weekend I decided it was time to rip into the car to remove the stock Bose amp and subwoofer (behind the driver’s seat) as well as try to tack down why the FM reception was non-existent. The first step was to get into the subwoofer location behind the driver’s seat, a quick screw driver inserted into the panelling to pop the cover off. pry and then pull it off. Once I removed the cover, I quickly found that the stock Bose setup had already been removed, I figured that might be the case, but wasn’t 100% sure until we pulled the cover off. While in there I took the time to clean up some of the stray wiring that was in there, some exposed wires, and some live power wires that simply had electrical tape wrapped around them. After working on the (lack there of) Sub, it was time to rip into the dashboard. I’ve done it so many times on my prior 350zs that it is straightforward and fairly painless to do. The one thing that gave me trouble was disconnecting the wiring harness from the center console where the harness powers the hazard, and seat warmer switches. I ended up pulling the panel up and off of the emergency brake in order to get to the plug for the wiring. Once I pulled the plastic for the console out of place I dug in behind the stereo itself. First thing I checked was to see if the antenna wiring was plugged into the head unit, unfortunatly it was, so that wasn’t going to be an easy fix! I tracked down some wires from the stereo by pulling down the manual from the Pioneer website.One thing I did find was there is the “mic” for the handsfree bluetooth setup was plugged into the “wired remote” port on the back of the head unit. I unplugged that, but unfortunately couldn’t plug it into the proper MIC input as the jack was the wrong size. I plugged the mic back into the W/R port and started playing around with the headunit to see if I could get any stations tuned. While digging in the center console compartment I found a wireless remote for the stereo, thinking that might work with “options” better than the touch screen I try to start using that, with no success. I checked the battery in the remote, and found it was a CR2016, but the remote said it took a CR2025, so I grabbed a spare and popped that in place. Ends up, that didn’t work either, no matter what I tried I couldn’t get the remote to work. Until I once again unplugged the mic from the “wired remote” port, one I did that the remote started working properly. So apparently whomever installed this radio, the wiring was done incorrectly on the MIC, and that was causing problems. I went ahead and left the MIC unplugged and put everything back together in the car. I immediately tried to tune FM, and found that I could actually tune to a specific station, where previously I was only able to scan, and with the lack of signal previously, the scan would continue until manually stopped by switching input sources. I still wasn’t able to get a clear tune on a station, but when I pulled the car out of the garage to reposition where it was parked, I did find that it started to get a signal to a local radio station here. So it looks like the ultimately problem with the radio may just have been the miswired Mic, we’ll see, next time I drive the car, how things play out. It might be a while though before I get back out in the Z, it has turned cold here in Missouri and I don’t plan to drive the car too much in below freezing temps, due to the abuse on the tires.